Caiman free games: Neo-Sonic Godspeed by Manicteam - Mike Burgess and Dave Mongeni. Amazing graphics, great gameplay and music makes this game a top game. 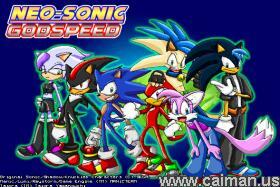 In this game you can play the character Sonic OR Shadow!!! This game has everything a good game needs, even 4 desktop wallpapers! 1. Traditional (Sonic): Kinda like what you are used to. You go through normal paths and what not. You can also use Chaos Relic Pads to teleport. 2. New (Shadow): Sorta, kinda for advanced players (or newbies, depending on yer learning curve). 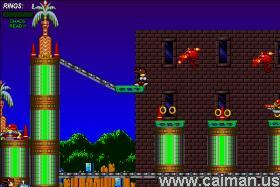 Like Sonic's gameplay only, to teleport through places, you need Chaos to control the enemies instant homing. For every 10 shards of Chaos Ghost Shards that come out of enemies, Sonic can release a 360 burst of Chaotic energy to destroy all that is near him. Neato torpedo. Perhaps the first Sonic fangame where Shadow takes advantage of Chaos control. For just one of the lousy shards, you can home in on near by enemies and destroy them. Imagine having a full Chaos bar then holding down the Z key...yes. Try to keep up. 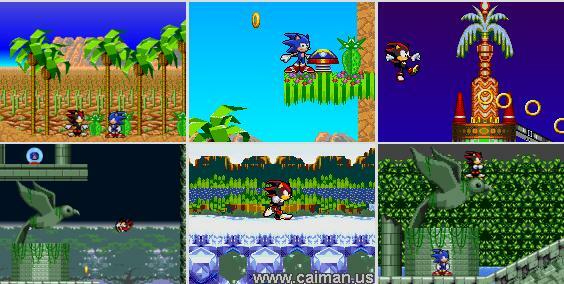 Of course, like any Sonic game, you have rings that you need to live. Collect 100 to get an extra man. There are Item boxes with rings, 1-ups, and invincibility. You have springs, insane badniks, and of course, unlockable stuff. Yeh. Also with a Spindash, it can shield you from most projectiles. Z = Action Key. This performs the character's specials, as well as serve as a main action for vehicles. C = Turns on and Turns off the lights in Miss Shuawzky's house located in Scotland. OH--also you jump with this key and may serve as a secondary action to vehicles. Ctrl+P = Pauses the game. F2 - Restarts the game. You lose. Esc = Quit the game. What the hell would make you do this?! Enter Key = Doesn't take a genius, now does it? Down Key + C = My first decent spindash. Holding the C Key while colliding with a Spring = Fly like a mofo. Mirror authors download (no install) 24,3 MB.